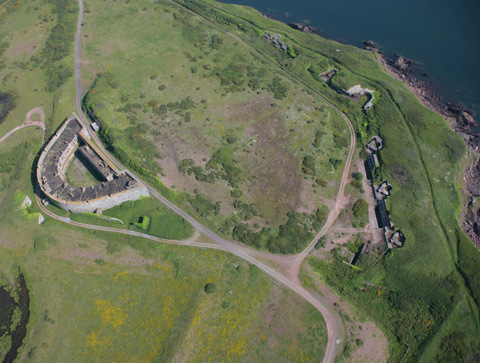 South Hook Fort was built to a similar design to Fort Hubberstone and was completed in 1865 and housed 20 nine-inch and seven-inch RML guns. It comprised two batteries linked by a covered way and protected by earthworks with a D-plan defensible barracks for 180 soldiers on high ground surrounded by a deep ditch. In the 1890s the west battery was altered to take a 9.2 inch BL gun and three twelve-pounder guns while the east battery was abandoned. It was manned during both World Wars and then sold off, now it is part of the South Hook refinery complex. The fort is not accessible to the public.